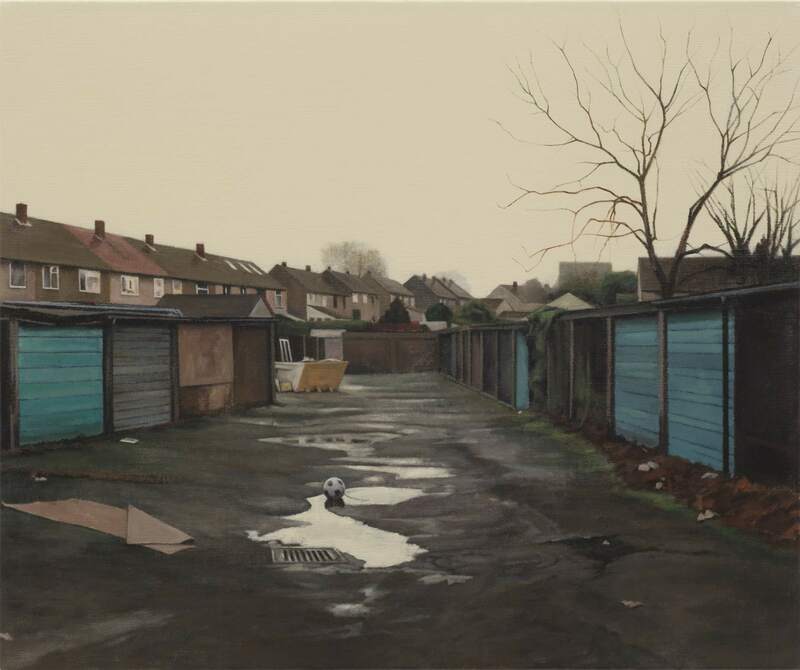 George Shaw’s apparently parochial, minutiae-focussed paintings are the result of slow, deliberate and reflective work: not (at least not only) in the fabrication, but in the preparation, in the preliminary examination and thought which goes into laying out in front of the artist the abstract material which he will proceed to transform. In fact, Shaw’s whole life has been this preparation, his uneventful childhood the fixed point through which everything else is looped. 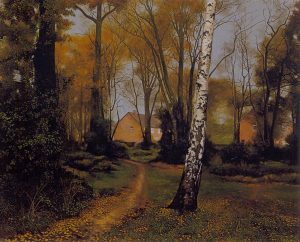 Shaw’s emotional involvement in the act of painting extends to his use of Humbrol enamel paint, a medium which he has made entirely his own, and which imparts to the paintings their simultaneous eerie superrealism and tawdry glossiness, as well as their exquisite detail and rich colour palette. The Humbrol brand is to Shaw a magical symbol, the sine qua non of his artistic practice, and a tangible connection to the childhood whose haunted council estate scenes he returns to compulsively. Shaw’s skies are particularly magnificent, the enamel paint luminously capturing the muted chromaticism of the drab lid that is the typical midlands sky; infinite tints of gray. They are perhaps the best British skies since Turner (although Shaw’s favoured painterly point of reference is Caspar David Friedrich); a visual ‘Every Day is Like Sunday’. Places where you go to inexist. Shaw has an appreciation of the profound mystery of the persistence of the banal, the unglamour of the ‘purely factual account’. But at his best he doesn’t cleave to the latter-day angloromanticism of decline, or the aestheticising poetics of poverty. Shaw paints stasis, waiting, the empty spaces where the time of childhood is frittered away. The experience of place is reduced to an underlying electric hum of nondescript, unobserved facticity. The paintings exclude people, both in their content and in the viewer’s engagement. They are places where the viewer is forgotten. You can’t get into them unless you agree to disappear from the world. This mystery is the only thing we can really call our own. Our own utopia, the nowhere to which we belong but which has literally nothing to offer us except silent meditation on our own unimportance. We fall between the cracks of existence, we can’t own what we are, the places proper to us are rarely mentioned (rare exceptions: Shaw’s paintings, Pulp’s songs). How remarkable, how valuable to us it is to see an artist not only understand but take the time to make a painting of a scene like The Path Behind The Shops. It’s not a ‘validation’, which would entail a sort of proprietorial pride over these banal origins, a longing for ‘representation’; it’s more a joyful wonder at Shaw’s ability to capture so precisely and positively, that which one had always marked down as an absence, at most something to be overcome or left behind. Shaw is also a writer, and many of his stated influences (Beckett, Lawrence) are literary rather than visual; perhaps the intensity of his paintings stems from their being a negative artefact of his literary endeavour, the stubbornly inarticulable residue which it is impossible to force into prose. Shaw works from his own photographs, and the informal, ‘found’ style of the paintings obviously owes much to the aesthetic of photography. But the manifest evidence of the photograph is thoroughly transformed in the act of painting so that this relation is complicated, the very nakedness of the photographic image brought into question. He is unapologetic about his own presence, or interference, in the process of image making: ‘I rarely draw anything without an emotional involvement with it’, he says. Consequently Shaw’s paintings, on anything more than the most cursory examination, are utterly resistant to being interpreted as an aleatory postmodern game, or an ironic joke. The work is not an attempt to transform the ridiculous into the sublime, the banal into the elevated, it’s not a case of excavating the intense occult forces beneath the veneer of an apparently boring suburbia. But neither is it mere nostalgia, although it is, in the proper sense of the word, a disquisition on home and the unhomely; not a longing for home but a puzzling at the relation between the arbitrary materiality and its emotionally compelling certainty. Adults submit the relationship of the shared, outside world with the intensive, inner landscapes to a severe disjunction, a deceptive decision that sunders the emotional from the factual. Like Proust’s delirious navigation through time and memory, the clarity of Shaw’s reconfusion allows us to revive the world of the child for whom round the back of the garages is as magical place as any. We recover not exactly an innocence, but perhaps an autonomy anterior to the cleavage between self and world, an ability to step out into a solitary, indeterminate imagination still open and teeming with possibility; unfocussed yet dazzling; unremarkable yet luminous; a gray area. Facts are never as banal as they look.